Before we even got to Out of Africa, Nolagirl was talking about getting pie on the way home. 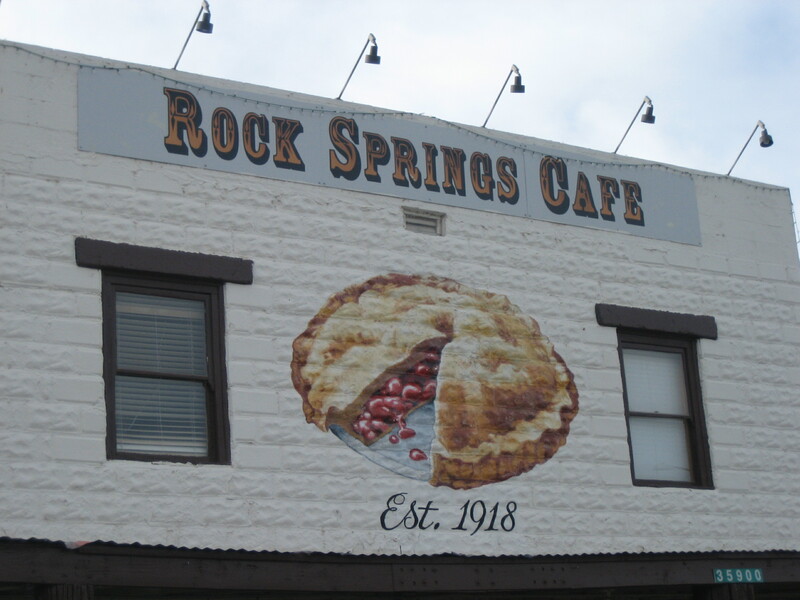 She said there was a restaurant between Camp Verde and Phoenix that has really amazing pie. She said she isn’t too enthusiastic about the food at the restaurant, but she really likes the pie. 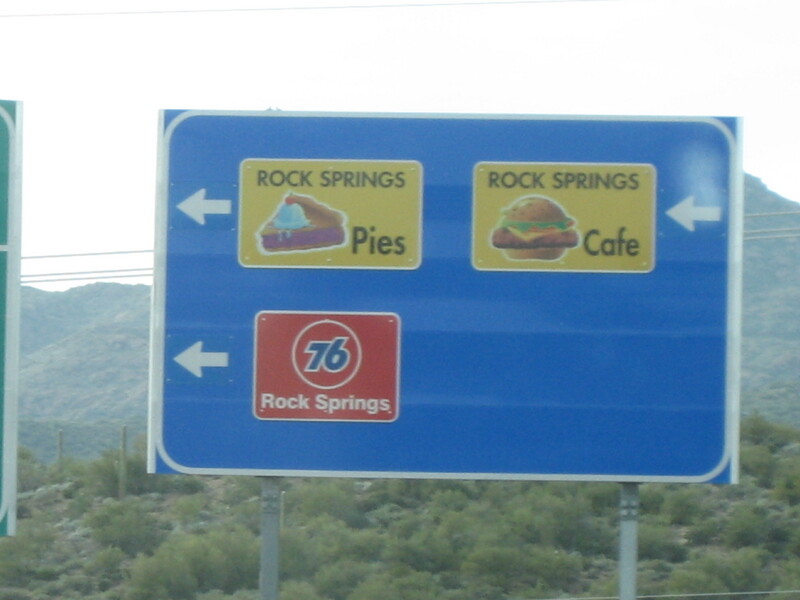 I think this was the first time I ever saw a picture of a slice of pie on a highway department sign. 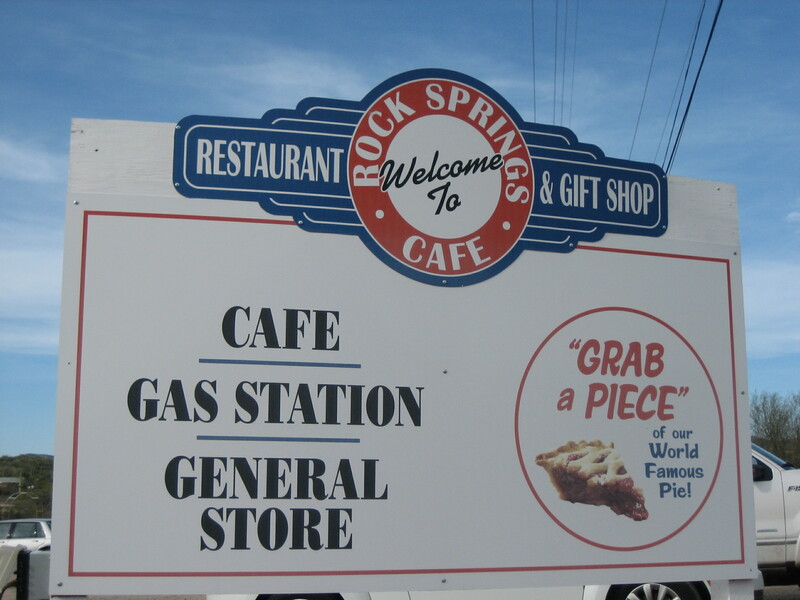 This is the sign outside the Rock Springs Cafe. Here’s what the front of the cafe looks like. Yippie for pie murals! We went inside, and there was some confusion about where to sit. There’s a tiny (two or three tables) sitting area behind the pie cases, but since there were four of us, we were told we should see the hostess about sitting in the dining room. The hostess said there would be a ten minute wait for a table, so we spent our waiting time looking at pie. The hostess finally sat us in the bar. I don’t know why we had to wait ten minutes. The place was not crowded, and there were several empty tables in the dining area. Our waiter was a young guy who looked just like a young guy working in a roadhouse should look. He had on dark jeans, a black t-shirt, and slicked back hair. I should have asked to take a photo of him, but I didn’t want him to think I was some flirting old lady. He took our pie orders, then brought water out to all of us. Nolagirl ordered the Jack Daniels Pecan. That’s her favorite. Little Phoenix ordered banana cream. The slice was huge, and she ate it all down. 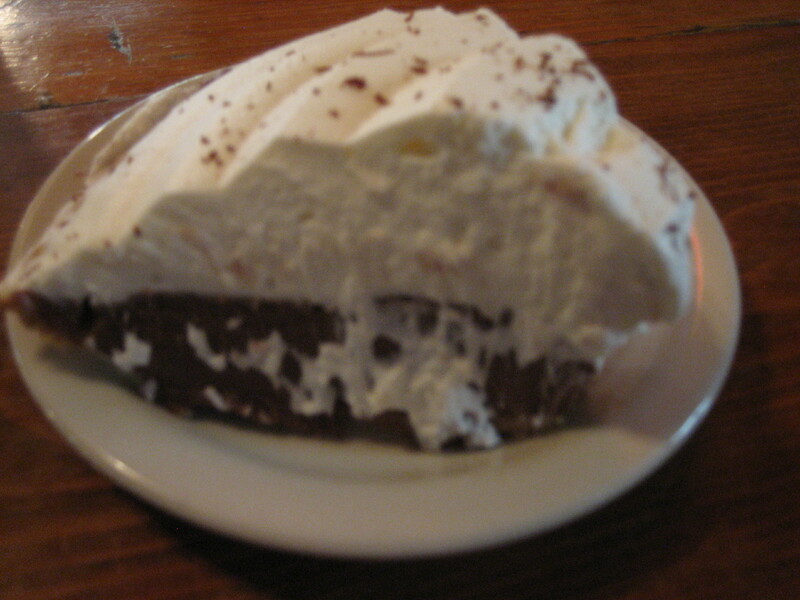 Izzy and I both ordered slices of chocolate cream pie. Oh. My. Goodness. It was so good. The cream part was thick and fluffy. The chocolate part was thick and silky. I ate every bite slowly and savored each mouthful. Oh yes, I think pie definitely is better than cake. Ice cream reigns supreme for me, of course. Ice cream on top of warm pie? Heaven!